Are you a “New American” immigrant, with experience farming in your home country? Or do you work with refugees or other immigrants in your community who might be interested in small-scale farming? If the answer is yes, the Groundswell Center for Local Food & Farming is looking for you. Groundswell provides hands-on training and support to beginning farmers in the Central NY region. Now, with support from the NYS Department of State (NY DOS), the Appalachian Regional Commission and Southern Tier East Regional Planning Development Board, Groundswell is developing new programs and resources especially aimed at helping immigrants to get started in farming. Funding for this effort comes from the “New Americans Initiative” recently launched by NY DOS. The new funding will enable Groundswell to enhance outreach, training and farm business incubation for immigrant and refugee beginning farmers. In addition to customized training programs for New Americans who have limited English-speaking skills, the following programs will again be offered in 2013 to English-speaking beginning farmers including, but not limited to New Americans. Additional information is available online at www.groundswellcenter.org. Sustainable Farming Certificate Program. This 100-hour curriculum runs April-November and includes on-farm educational workshops, class-room training, supervised on-farm work experience, and an introduction to business planning. Farm Business Planning Course. This 30-hour program runs January to March and provides intensive class-room training and business planning support for beginning farmers. Finger Lakes Collaborative Regional Alliance in Farmer Training (CRAFT). This is a farmer-to-farmer learning network comprised of experienced Mentor Farmers, beginning farmers and farming interns. 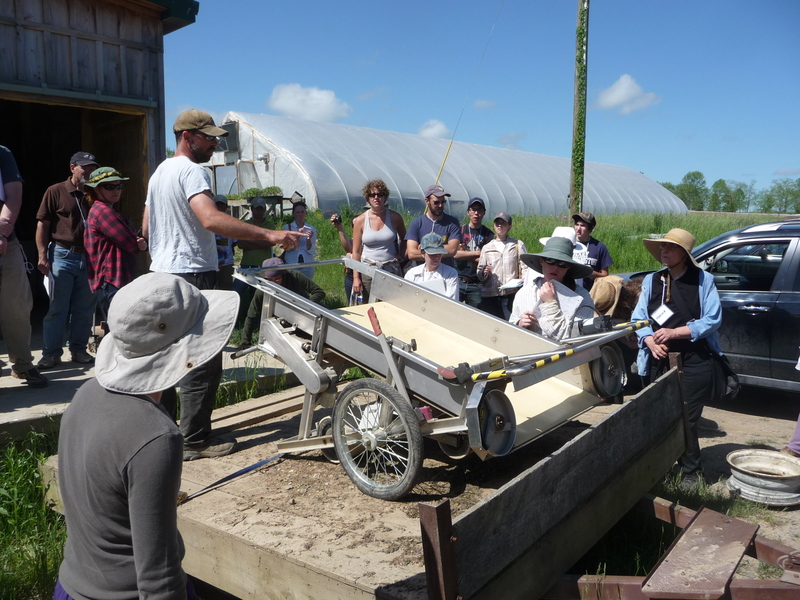 The CRAFT meets monthly for educational farm tours and social events. The Groundswell Farm Enterprise Incubator provides affordable access to land, production infrastructure, equipment, support services (such as tractor tillage), and mentoring from experienced farmers, on a ten-acre site owned by EcoVillage at Ithaca. The Incubator program is now open for applications from immigrant and non-immigrant beginning farmers, and offers a low-risk low-cost entry avenue for those who do not have access to land of their own. Beginning this spring Groundswell will offer customized training in farm business management, production and marketing, as well as personalized mentoring from experienced farmers and business advisors. For those with limited English language skills, ESL support and/or interpreters and translators will be provided. Affordable access to land, water and equipment will also be available at the Groundswell Incubator Farm, at EcoVillage in Ithaca, New York. “This project will significantly boost our ability to train and support New American beginning farmers,” says Devon Van Noble, Coordinator of Groundswell’s Incubator Farm. “We’ve already had a number of New Americans in our beginning farmer programs, including recent immigrants from Turkey, Mexico, Japan, Myanmar, Puerto Rico (US), China and Spain.” Many immigrants are able to participate fully in Groundswell’s existing programs, but those with significant language barriers or cultural barriers need more customized support. Groundswell is looking for help from community-based groups who work with immigrants and refugees in Broome, Chemung, Chenango, Cortland, Schuyler, Steuben, Tioga and Tompkins Counties. If you know of individuals or communities who may have an interest in farming, please contact us at 607-319-5095 or info@groundswellcenter.org. Groundswell has a strong commitment to supporting beginning farmers from historically disadvantaged populations, including people of color, immigrants, and those with very limited economic resources, who have often been excluded from the sustainable farming and local foods movements. Joanna Green is Director of the Groundswell Center for Local Food & Farming. Groundswell is a collaborative initiative of the EcoVillage Center for Sustainability Education/Center for Transformative Action, serving the broader Finger Lakes and Central New York region. Groundswell’s mission is to engage diverse learners and empower them with skills, knowledge and access to resources so they can build sustainable land-based livelihoods and equitable local food systems. For more information about Groundswell’s beginning farmer training programs visit www.groundswellcenter.org.